Tropical Coral ($27; saksfifthavenue.com and Saks Stores) is a gorgeous hot coral creme nail lacquer, limited-edition, part of Dolce & Gabbana’s Tropical Spring ’17 Collection. 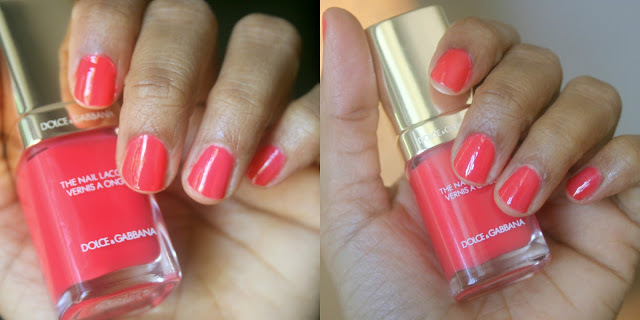 Its a beautiful bright color that looks fabulous on the fingers & toes. The finish is a creamy jelly, opaque in two coats and the brush is fantastic too. Tropical Coral would make for a lovely pedicure color for the summer. I also loved the smooth consistency, quick drying formula and the bright, but not too neon color. If you are looking for a bright coral with just a hint of orange in an almost perfect formula, this is one to definitely check out.